Hi everyone. Missed the 25th episode of Hybrid Theory? Listen to the podcast online and have a blast ! 2014 start now! There was a problem during the broadcast of the january episode of tranceplorations, the december edition of my set was on air so it's time to catch up now with the right mix. I hope you will enjoy this moment mixing good old uplifting sounds and more recent psy/prog trance influences. Tranceplorations 11/2013 your monthly 4 hours marathon was broadcasted last friday on pulsradio.com, check the podcast online or grab your free mp3 copy of the episode. Hi everyone. Missed the 24th episode of Hybrid Theory? Listen to the podcast online and have a blast ! Hi everyone ! Get prepared for the 23th episode of Hybrid Theory. A 100% uplifting episode with Lyctum, Simon Patterson, Harmonic Rush, Jase Thirlwall, Moonsouls, Ian Standerwick, Ferrin & Morris, ReOrder, Temple One and many more. Join the facebook event. 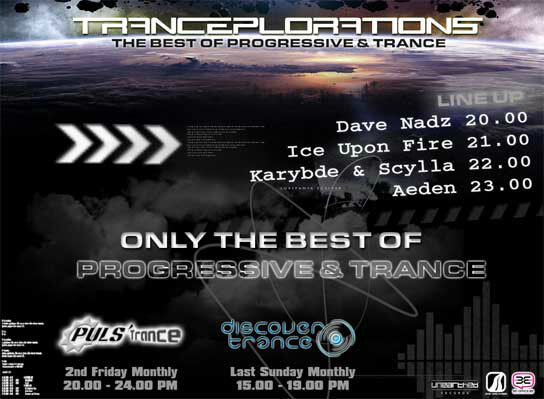 Tranceplorations 11/2013 your monthly 4 hours marathon was broadcasted last friday on pulsradio.com. My mates Dephasys, Karybde & Scylla and Aeden recorded such banging episodes !!! It was awesome !!! I you missed it you should get your dose of uplifting music now on soundcloud, mixcloud, or the official website of Tranceplorations. If you missed the 21th episode of Hybrid Theory feel free to check the podcast or grab your free copy. Tonight dont miss a brand new episode of Hybrid Theory. The episode number 20! I promise you a very special and dancing one. One hour of pure deep underground music with: Airwave?, rex mundi, readhead, pasqalue, matt minimal, alex di stefano, umek, peter plaznik?, gareth weston ?, paul oakenfold a.r.d.i., bryan kearney and so many more !!! The Hybrid Theory 019 podcast is here ! Boom, proper trance inside with Mike Foyle, Store N Forward, Ferry Tayle, Luke Bond, Function C & Luke Terry, John Dopping, Ferrin & Morris etc. So feel free to grab the download (check the link above) or listen to it online on mixcloud or soundcloud.